The Seino region nurtured by the Kiso Three Rivers has long enjoyed an abundant range of river fish cuisine. The Arame-maki rolls of crucian carp, which are rolls of crucian carp wrapped in arame (a kind of seaweed), is a dish still popular and much-loved in the community to this day. The rolls are seasoned to a salty-sweet, elegant taste with miso, soy sauce, sugar, sake, etc. They make the perfect accompaniment for rice and alcoholic drinks. Crucian carp is grilled until aromatically roasted, then carefully wrapped with arame one by one, and the rolls are cooked until tender. The rolls are seasoned simply with just soy sauce and sugar; they have a soft taste and are easy to eat. "Arame-maki rolls" are now hardly ever made at home. Why not try them here? ＜Messages from the Staff＞ You cannot enjoy this item anywhere else! Why not come and try? 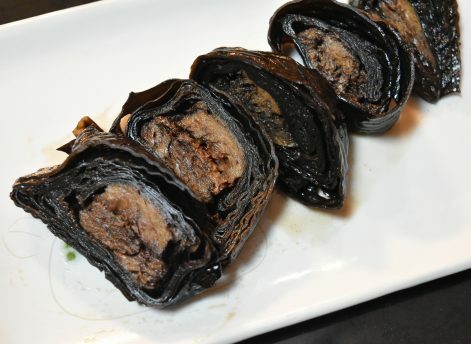 Arame is carefully made into rolls, one by one. It is rich in calcium, potassium and dietary fiber. Kanroni of sweetfish, cooked in sweetened soy sauce; crucian carp cooked in miso; Moroko-Zushi and other items are available. Kanezen Outlet is the place for river fish delicacies.